In this edition of the RGT Guitar Tutor Interview Series, we are sitting down with Chester-based guitarist and guitar teacher Matt Warnock. Having grown up in Canada, educated and taught at Universities and music academies in the US and Brazil, Matt has now settled in the UK where he runs an online guitar teaching website, lectures at the University of Chester and is an RGT examiner and guitar tutor. In this interview, RGT Guitar Tutor Jamie Holroyd sits down with Matt to discuss his thoughts on RGT Jazz Guitar Exams, teaching Skype guitar lessons and his advice for people just starting out with teaching guitar. To find out more about Matt’s teaching and performing careers, visit the Matt Warnock Guitar Page or Matt Warnock Guitar Facebook Page. 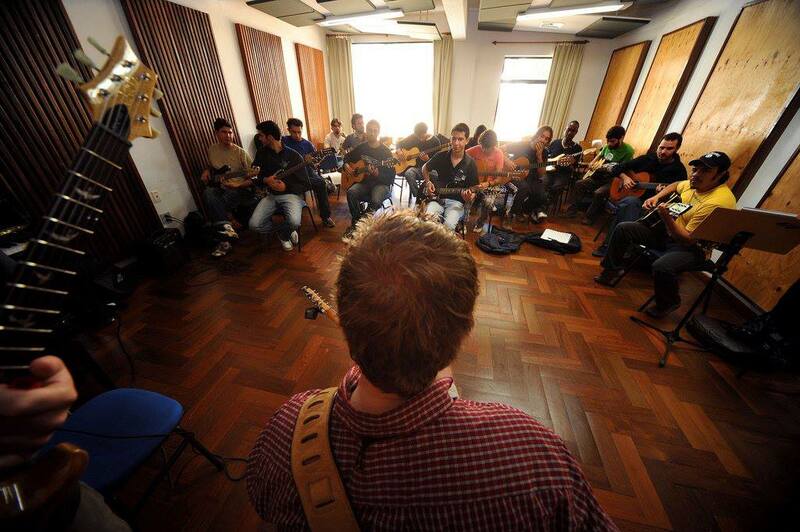 RGT: How did you become aware of RGT, and why do you choose to encourage your students to take RGT guitar exams? Matthew Warnock: I first became aware of RGT when I moved to Manchester in January of 2012. I was looking to find work in the UK as I had just relocated here from Brazil, where I was teaching and playing in jazz samba groups, and when I Googled “UK Guitar” RGT’s site came up. After reading about what they offer, I was immediately drawn to the fact that they were an accredited exam body for guitar, but that they offered exams in Rock, Jazz, Acoustic and Electric guitar, not just Classical as had been the case when I did exams growing up in Canada. So, I sent them a CV hoping I would be considered for an examiner’s position at some point down the road, and it just happened to be at a time when they were looking for new examiners. So I was invited to the audition day and later was offered a position examining for RGT. As far as encouraging my students to take RGT exams, as I only teach jazz guitar lessons, I feel that RGT’s Jazz Guitar Diploma exams offer a valuable alternative to a University or Conservatory program, especially for people that are already working as teachers and performers, and can’t take three to four years out of their life to attend a full-time program. So, I recommend these exams for my students that want an accredited qualification in Jazz Guitar, but want to study on their own time and take the exams when they feel ready, and not necessarily be tied into an academic calendar. As well, the cost comparison between taking the RGT exams versus a University program is not even close, as University tuition rates are climbing everywhere, so these exams are also a financially viable option for those that don’t want to borrow tens of thousands of pounds, or dollars, to attend a traditional university music program. I still have students that I work with and recommend attending Conservatories and Universities, but RGT’s Jazz Guitar Exams are great for those students who might not be able to commit full-time to a three or four-year undergrad program. Last year I had my first student sit his DipLCM Jazz Guitar Exam, where he achieved a High Pass, and right now I have six students, one in-person and five on Skype, that are preparing for the DipLCM and ALCM Jazz Guitar Exams for this coming year. Matthew Warnock: For me, the biggest challenge is usually making sure that students focus on the material that needs the most work, and that is worth the most marks on any given exam. It’s easy to work on the required tunes for a Jazz Guitar Exam, but the sight comping and sight soloing sections are usually the ones people struggle with the most, and so I need to make sure that we focus enough attention on those sections and do well with them, as well as the prepared pieces. As well, when looking at a Jazz Guitar Diploma Exam, there is a long list of chords, scales and arpeggios that candidates need to learn, and so many students spend a lot of time on these technical requirements in the practice room each week. But, when you look at the exam marking scheme, this section is only worth 20% of the overall grade, and so we need to make sure that we focus 20% of our practice time on this section, and not get carried away, leading to the student ignoring the sight comping, tunes or sight improvising sections of the exam. RGT: As someone who has taught countless guitar lessons before teaching on Skype, did you have to make any adaptations to your teaching style and do you think any guitar teacher can teach online? Matthew Warnock: I truly believe that any guitar teacher who teaches in-person lesson can also teach effectively through Skype, as long as they’re willing and able to adapt to the subtleties that aries when working through video, that don’t occur when working with in-person students. The big adaption that needs to be made right from the start, is that it can be hard to jam with a student on Skype as their could be a slight delay or the sound could be muted by the loud guitars in the microphones. To counter this, I send all of my students backing tracks ahead of time, or during the lessons, so that they are able to jam along with chord changes and tunes in our lessons, which is important, and we get around any technical issues that occur because of the medium we’re in. As well, I have had to learn to use my ears much more in lesson, rather than sight, to pick up on problems or issues that students are having with technique and the physical aspect of the guitar. I can’t always see their entire bodies when they’re on camera, so if something sounds funny, I need to know that their legs are in a funny position, or their posture isn’t correct, or that their thumb is in the wrong position behind the neck, all by ear, which I could normally see when working in-person with a student. RGT: What has been the biggest reward and challenge so far in running your online teaching website www.mattwarnockguitar.com? Matthew Warnock: The biggest reward has easily been meeting all of the thousands of guitarists from all over the world that I’ve been able to reach with the site over the past few years. Whether it’s people that buy my books, chat with me on Facebook or Twitter, email me questions or take Skype lessons, it’s always fun meeting and interacting with people from all over who are interested in learning jazz guitar. The challenge has been transitioning from having the site and my online teaching be a hobby, as it was when I started, to becoming my full-time career. Knowing the right time to walk away from certain opportunities and past jobs to focus on my website and online teaching endeavours wasn’t always easy, but I’m glad I made those tough choices when I did as I love every minute I spend working on the site, writing new ebooks, teaching my Skype students and developing new jazz guitar learning Apps. RGT: These days it seems that the traditional method of learning from older players is being replaced by the college teaching system. Do you feel that jazz is becoming stagnant because of this change in how the genre is learned and taught? Matthew Warnock: I don’t think it’s becoming stagnant, though I do agree that things have changed over the years in how one goes about learning to play jazz. There was a big shift into people attending college and conservatories to study jazz guitar, especially in the ‘90s and ‘00s when I was in school. But, I think that the internet is changing that a bit, and we’re coming full circle to a time where people can now go online and study with their favorite players. Whether it’s taking Skype lessons, attending an online workshop, signing up for a site like Jimmy Bruno’s lesson site or Martin Taylor’s site, or even just watching teaching videos on YouTube, people today can access their favorite players and learn from them in ways that I never could when I was coming up. Now, all of this online study doesn’t replace the learning experience of playing on the bandstand with older, more experienced players, but as people move more into the online realm, I wouldn’t be surprised if we see more live jams between people online, and that also becomes a part of the mentoring process, where younger players are hired to play in online jams with veteran jazzers, allowing them to learn that way as well. Who knows what the future will bring, but I think it would be great if it ended up being a mix of colleges, in-person concerts, online study and interactive online jams/concerts by jazz musicians from all over the world. RGT: You are probably the most qualified jazz guitarist I ever have met. How have these qualifications affected your career as a jazz musician? Matthew Warnock: Well, if you mean that I have a bunch of degrees, then yes those have helped open doors to me over the course of my career, but maybe not in the way that I would have thought when I was going through school. I always planned on being a University Professor, teaching jazz and jazz guitar, which I did do full-time for six years in the US, and part-time for the last two years in the UK. While my degrees did help get me interviews for those jobs, it was my experiences and performance ability that really got me those opportunities. In my business endeavours, the degrees help show people that I have spent the time and done the right things to become an expert in my field, but again, it all boils down to my experiences, what I’ve done with past positions and what people feel I can offer them as a guitar teacher, business partner or when they hire me as a performer. I would say that I’m glad I have my degrees, but that it was all the extra hours I spent gaining performance, teaching, business and other experiences that have helped the most when it’s come down to building my career and allowing me to do the fun things I’ve been able to in music over the years. RGT: What advice do you have for young players who are just beginning their careers as jazz guitarists? 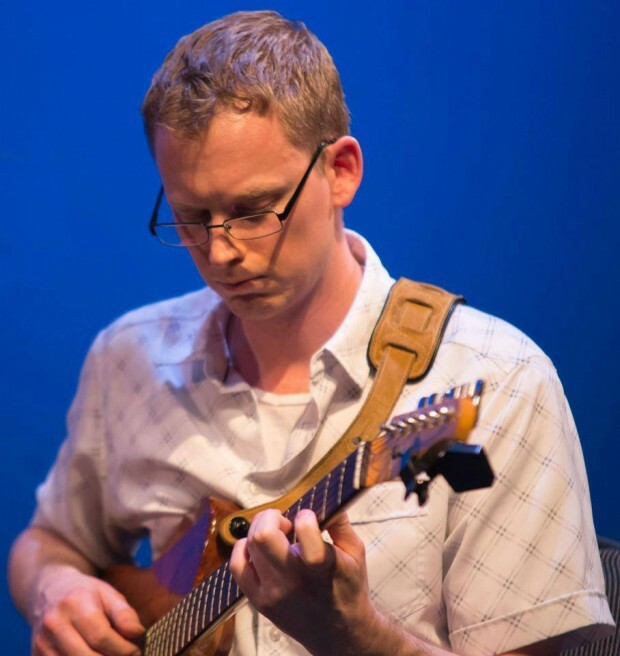 Matthew Warnock: With my students, that are pursuing jazz guitar as a career option, I advise them to get out there and gig and teach as much as they can while they’re in school, in order to build a solid resume and gain valuable experiences that they can then use to build their careers after graduation. As well, I think any musician would benefit from studying business skills such as Self Promotion, Marketing, Product Development or Project Management, as these skills can often mean the difference between making a living solely in music, or having to work a day job outside the music industry when first starting a career in jazz. So, taking courses, or doing a business degree, are things that can be very helpful, and they’re things that I wish I had done back in the day, rather than have to learn about that side of the industry through trial and error along the way. RGT: Having co-designed your own custom Koentopp Telecaster Guitar, what are the features you look for in a good guitar? Matthew Warnock: With that guitar I didn’t really do much designing, I just told Dan I wanted a guitar that would be versatile, have a neck like my old ’66 Tele and be perfectly balanced when I was sitting or standing, and Dan delivered on all three of those things. I always look for a guitar that is balanced weight wise when I’m playing. There’s nothing more annoying that a nice guitar that falls forwards or backwards when I’m playing, causing me to fight with the guitar rather than just play it. So, that’s an important aspect for me. That and having it be stable and in good working condition all the time. If a guitar plays great, but can’t stay in tune, or the intonation is never perfect, then to me it’s not a practical instrument. So most of what I look for is playability, and I’ve found that in this guitar, which is why I don’t play anything else. RGT: If you had one piece of advice for guitar tutors, what would it be? Matthew Warnock: Don’t teach for money if you don’t love what you do. There’s nothing worse than a student paying for a lesson and it’s obvious that the teacher is only there for the pay check. If you want to be a guitar teacher, then invest yourself in your students, put 100% of yourself into each lesson, and have a vested interest in their development. If you do that, then your students will grow, become better players, have fun, and tell their friends and others about how much they enjoy and benefit from your lessons. This will allow you to grow your studio, be more successful, and do it all with the student’s needs and well-being at the forefront of what you do. 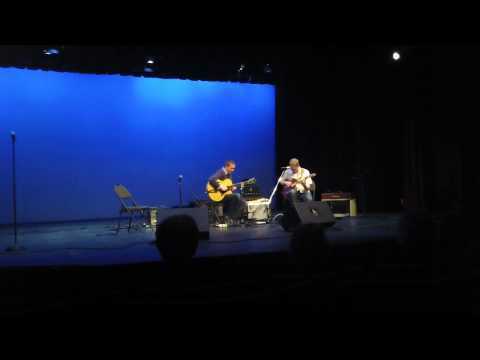 This entry was posted in RGT Teacher Interviews and tagged Jazz Guitar Exams by Alan. Bookmark the permalink. After 30 years playing in R&B and rock’n’soul cover bands, I’ve finally got the time to begin learning how to play jazz guitar properly, and I’m working through Matt’s “Beginning Jazz Guitar” study program at home on my own. So far, so good, and this interview was interesting, as I wondered about his background, etc. Thanks John. Glad you liked the interview and thanks for checking out the book. Nice catch on the few small typos. Got em fixed up. Cheers.